“The therapy I never knew I needed.” That was how one reader described our reader dinner at Huntsman last year, and this year’s was no different. They embraced the opportunity to talk about their love of clothing, their experiences with different brands and retailers, and the attitude of their peers. One popular topic was propriety in clothing: how much what you wear should be shape by people and place. On the one hand, readers expressed dismay at how casually men would often dress to go out to a smart dinner, or attend a celebratory event. Making an effort in how you dress is a compliment to your host, after all. But on the other hand, if everyone dresses casually, then you inevitably have to dress down a little to avoid standing out too much. Is it almost as rude to hugely overdress as it is to underdress? We all met initially for drinks downstairs at Huntsman, where the readers were given a mini tour and history lesson about the house. 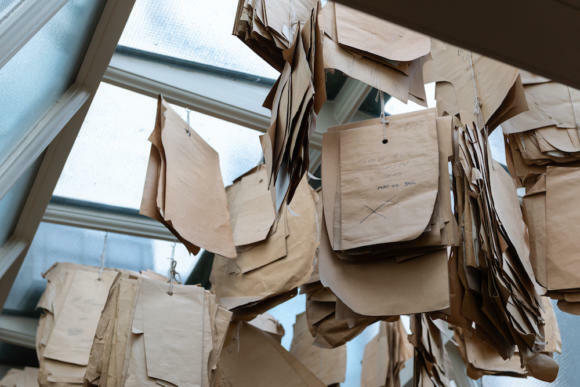 That’s easy at Huntsman, where every piece of decoration has a story. The breeches, for example, that are the only remaining piece made for Henry Huntsman - and which had been handed down, repaired and adjusted, through several generations. Or the stag’s heads that were left at the shop by two customers who left for a boozy lunch, and never came back. They’ve been mounted on the wall ever since. One of my favourite parts of the evening is halfway through dinner, when we ask everyone to stand up and talk briefly about what they’re wearing. This is clearly something everyone enjoys, given the amount of thought they put into their submission. 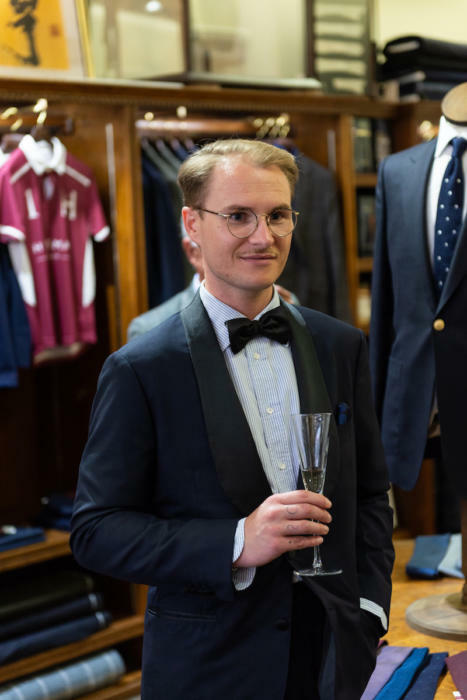 There’s Mattia (below) for instance, who is interested in expanding the opportunities for wearing evening wear - and therefore likes to wear his midnight-blue tuxedo from Massimo Piombo with more casual items like a striped oxford shirt. The shirt was from Aspesi, and he wore black tasselled loafers on the feet. 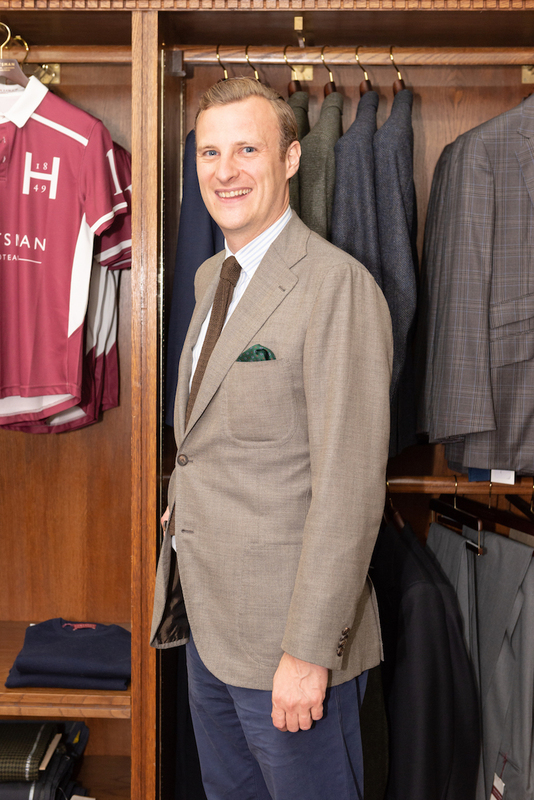 Or there was Daniel (below) who finds he favours more and more muted colours in the summer - and therefore liked the combination here of blue hopsack jacket, beige trousers, white shirt and cream tie. The jacket and shirt were made by bespoke artisans in Rome, where Daniel lives, while the trousers were made-to-measure by Lanieri. Below them he wore brown Velasca loafers. Both Daniel and Mattia came in from Italy. 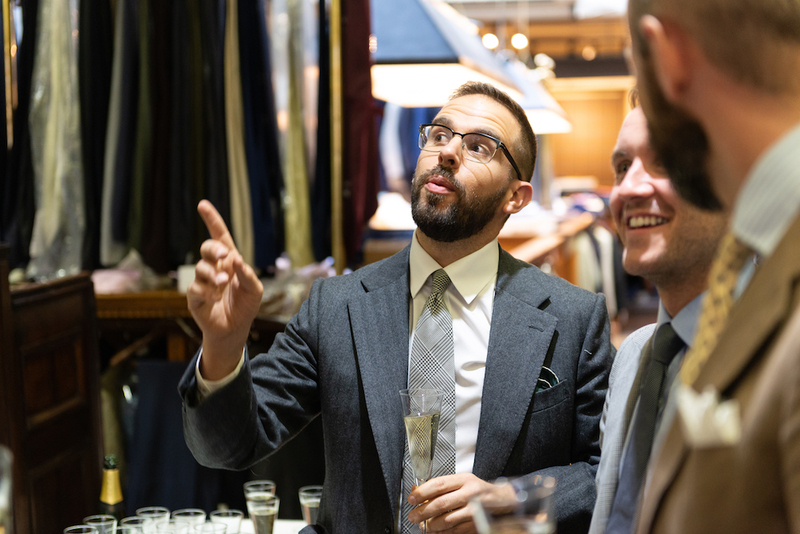 Clive (below)’s fascination is with second-hand discoveries, and he is justly proud of his bespoke black-linen jacket from Smalto, which he found in a charity shop and had altered. 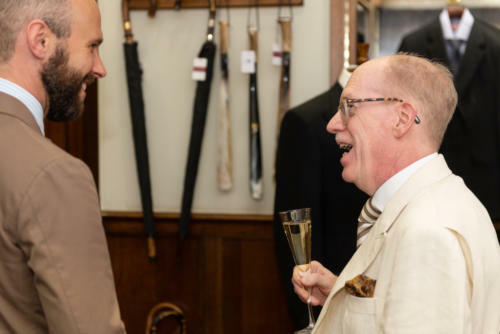 He wore it with cream Brioni trousers, Turnbull & Asser belt and tie, Chester Barrie striped shirt, Mulberry pocket square and Bestetti loafers - all vintage or from outlet shops. My favourite piece was his flower, however, which had been picked from his garden and preserved by wrapping the end in damp tissue, and containing that in tin foil. It stayed fresh all night. 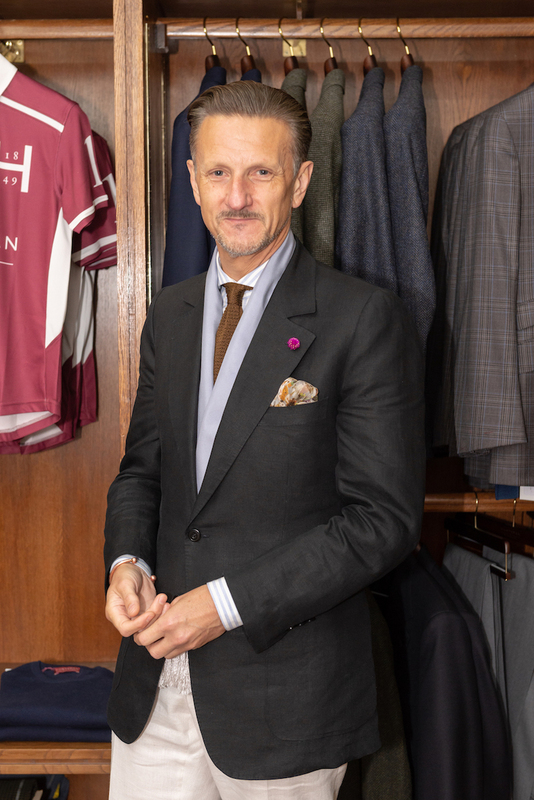 Marinus (below) came in from Munich, and talked about his tweed jacket - which was woven in 100% silk, rather than the wool one would immediately think. That made it extremely cool, and he picked up a green in the weave in his green tie. Marinus works in finance in Munich and likes to push back a little at the conservatism of his colleagues - in this case with the blue-suede shoes he wore below his blue trousers. Andy (below) flew in from Madrid but spent many years living in New York, having to carry in his suit jacket on the Metro every day in the hot summer. 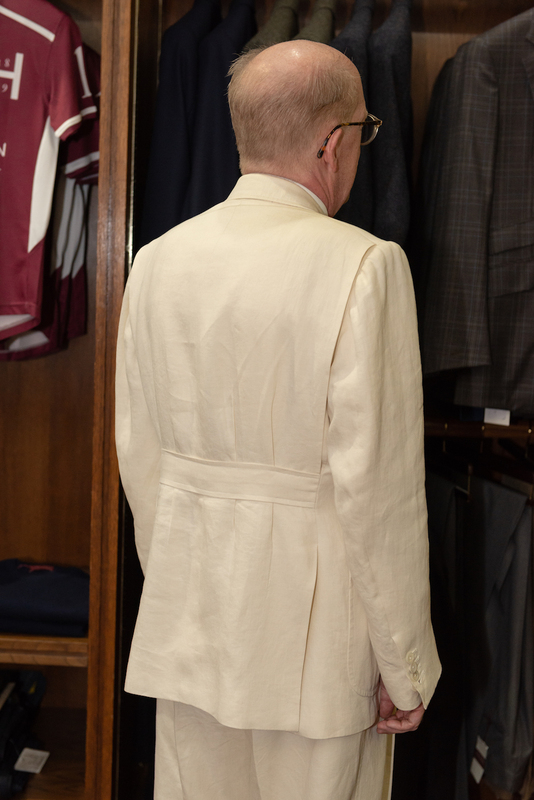 He finally had a specialty summer jacket made - this grey/brown hopsack from Sartoria Formosa via No Man Walks Alone. It makes a good backdrop for stronger shirt colours and patterns, such as the stripe here made by Thom Sweeney. Patrick’s suit was rather special. Made by the late Italo-American tailor Michele Savoia, it is a three piece in cream linen with various 1930s details: action back, pleated pockets, half belt with pleats, and high-waisted, full-cut trousers. Patrick was the consul-general for the US in Naples for a time, and had many anecdotes of trying to work with the local organisations (state and non-state!). His accessories were full-on as well: brown/cream satin tie, vintage silk handkchief, and brown/white spectator shoes. 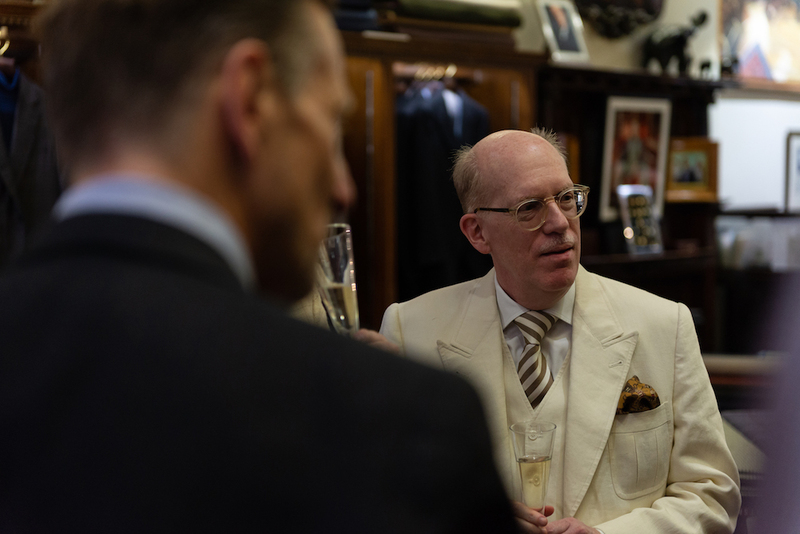 Tom Vause (below) was the only other man in a cotton suit other than me, which he had made at Tailormade in London. He was a particular fan of the multi-coloured grenadine tie, made by Spacca Neapolis. 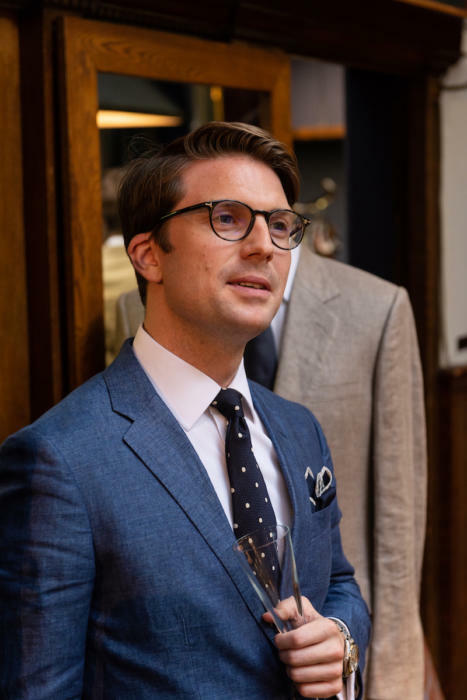 Not all the tailoring was bespoke or made to measure - the emphasis is very much on summer styles rather than craft - and Fearghus (below) wore a Ralph Lauren suit that (rather typically of RL) had a beautiful texture the like of which I've seen nowhere in bespoke books. A pure linen, it was loosely woven and didn’t crease that much during the evening. 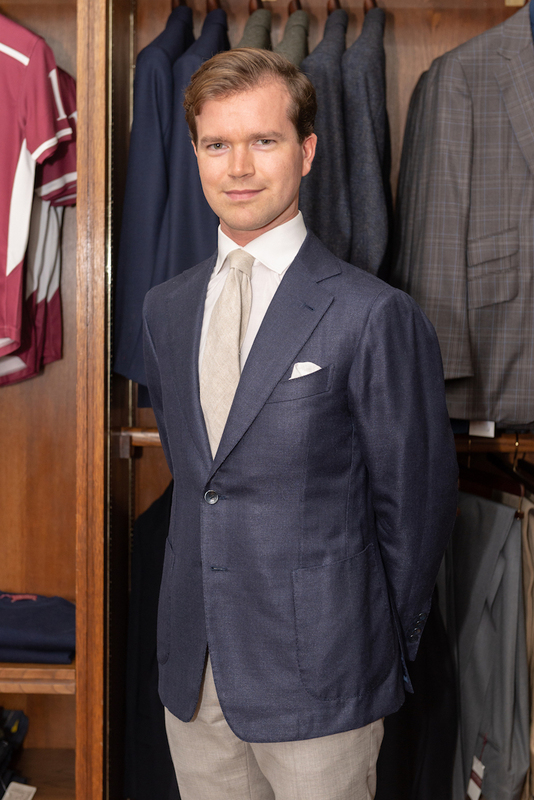 He wore it with basics elsewhere, to tone down the brightness of the suit (the opposite approach to Patrick) - white buttondown shirt and navy tie. Tommy took the same route, toning down his sugarbag-blue linen suit with a white shirt and navy spotted tie. Perhaps the most conservative of the outfits on display during the evening, but no less elegant for it. And last but by no means least, Jonathan, who wore a grey high-twist wool suit with a windowpane pattern. 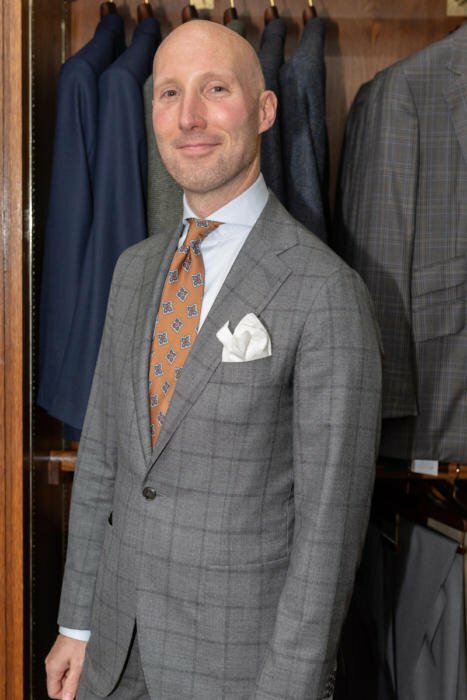 For a windowpane the suit is very subtle and - as Jonathan put it - it doesn’t feel like it’s wearing him. 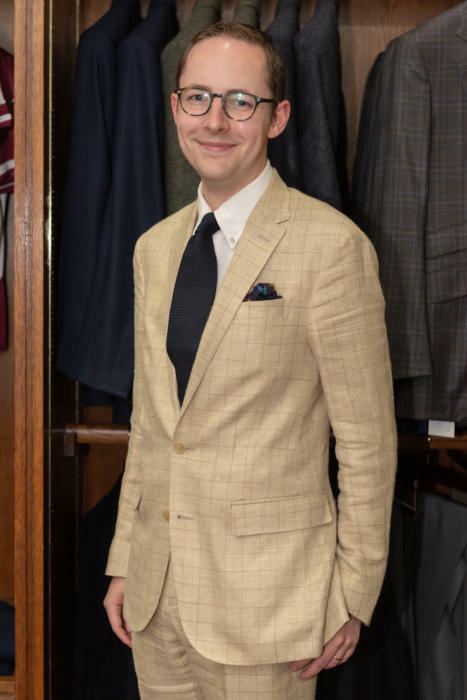 The jacket, he also pointed out, is very softly structured and half-lined, which helped with the heat on what was a very warm evening. Orange silk tie and white linen handkerchief, with white braces hidden underneath the jacket. I might use my outfit for a separate post sometime. For now, I’d just like to say a big thanks to Huntsman - to Poppy, Poppy and all - and to everyone for coming. And again, sorry to those that didn’t win this time. I didn’t anticipate when I set this up how much more I’d have to disappoint people than congratulate them! 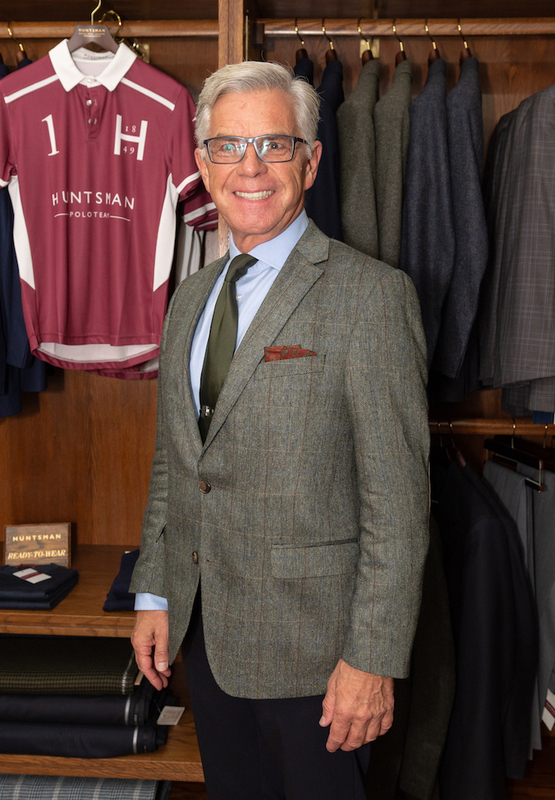 You can follow the discussion on Summer outfits at the Huntsman dinner 2018 by entering your email address in the box below. You will then receive an email every time a new comment is added. These will also contain a link to a page where you can stop the alerts, and remove all of your related data from the site. Hopefully this event – or similar – can be done again. It’s interesting to see and learn about my Permanent Style reading peers. Out of this bunch, I think that I like the look of the jacket that Daniel wore the most. It looks like it has a bit more defined shoulder line, and maybe a touch of extension? Very true but with the notable exception of Patrick who looked splendid. Tom Wolfe would have loved his suit. Ferghus’ suit looked fine too. 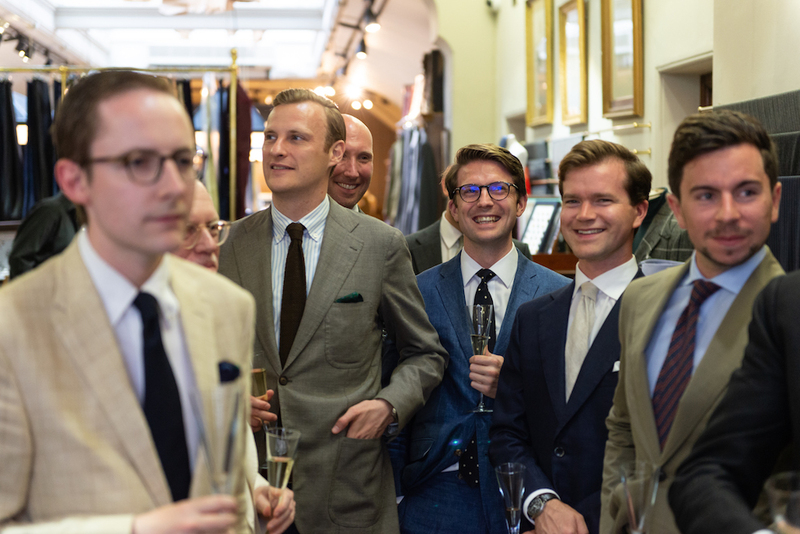 It’s amazing that no one wore anything from Savile Row, especially the hosting firm. I’d have worn my Royal blue linen suit from Huntsman but the requirement to be photographed put me off. There’s no need to apologise as I totally understand your attendance requirements/conditions. Having had a high profile in my profession/industry, my presence would have attracted unwanted media attention. The malign activities of trolls on social media could have been a major problem too. I value and protect my online privacy and hope that you were not offended by my comment. Some exceptionally elegant people, love most of those endembles. All your photographed guests look beautifully dressed pleasing to the eE and in good mood! Congratulations on your successful project, Simon! I guess motive of the action (what one wears) is insufficient? Thanks for sharing. And thanks to all of you who have made this event worth being shared indeed! It looks to have been a lovely evening! The most striking and interesting feature is that none has played safe. Conveying confidence and thus a keen sense of style is expressed in all these outfits. Playing safe for such a Summer event could have been really boring! Never felt the need to comment before – but this piece (especially the profiles and photos of fellow readers) was a delightful read. Made me proud to be a reader. You say that Clive wore a “bespoke black-linen jacket from Smalto, which he found in a charity shop and had altered.” How is it bespoke if he bought it and then had it altered? Or was it originally bespoke and then he had it altered? Great post, loved the pictures. Came across your post & found it very interesting. Loved how the ten winners showed their individual styles – each one was exceptional. Society has become too casual anymore. Elegance & refinement definitely has a place. Re. 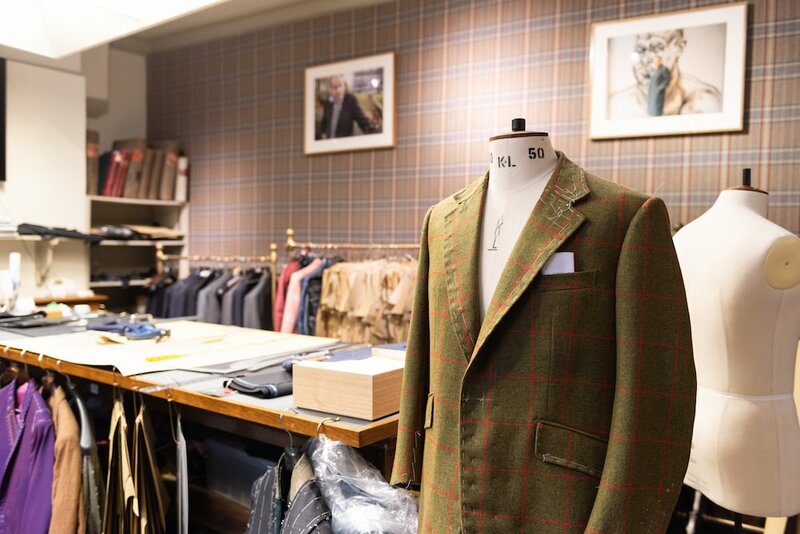 para five and casual dress – perhaps you write for a select group, indeed it could be argued that those who wear bespoke are in an economically select group. I fully agree that there are too few opportunities to ‘dress up’ but for many in the UK and elsewhere economic circumstance dictate that funds go elsewhere rather than to fine clothing. Additionally, the driver for less formality is often women who see it as part of the ‘patriarchy’. 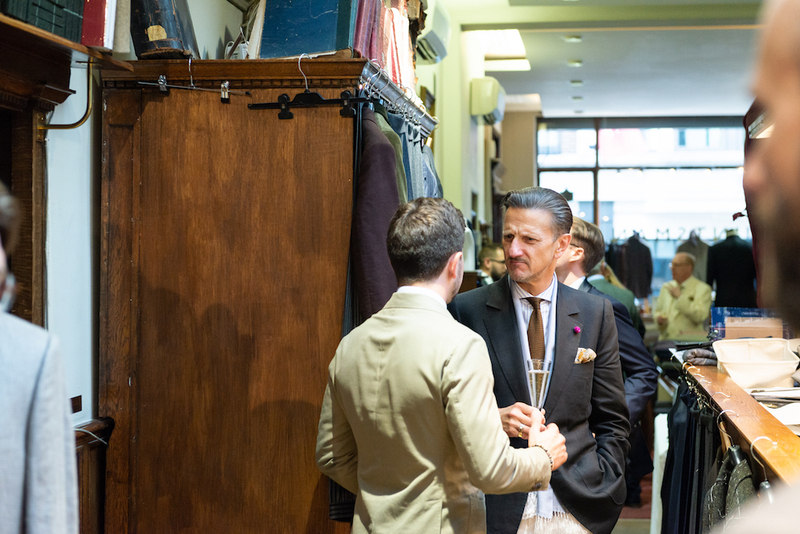 It was an all male event – transfer it to mixed company and formality dissipates – as do the ties. Any change to get the fabric of Tommy’s sugar bag-blue-linen? Or is there a particular one you, Simon, would recommend? – Beautiful and elegant! It wasn’t bespoke I’m afraid, so no. Are there really similar? 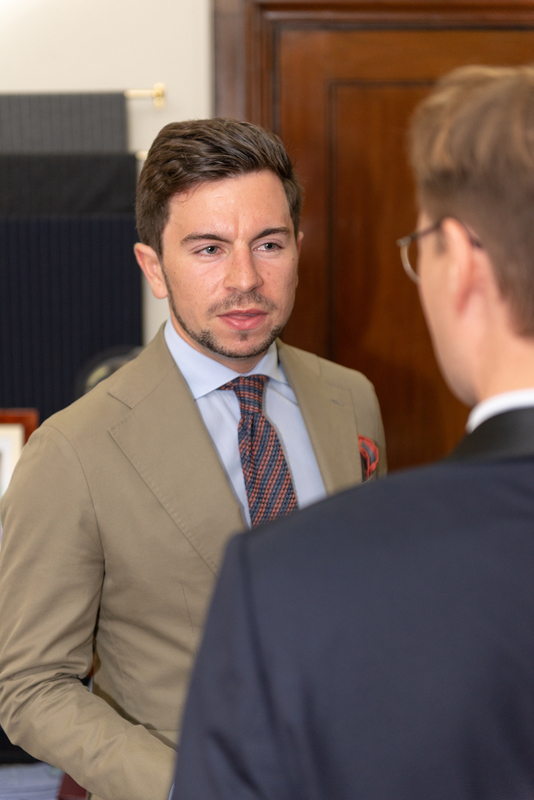 In the pictures this one looks much less „bright“, more similar to your air-force blue – and I do remember you said back in your summer post you would not have a whole suit made in sugar-bag-linen, I was therefore surprised to see how „conservative“ this one blended in. – Or it that all about light und photographs? Thanks in any case, I shall certainly have a look at the W Bill buch, if still available. 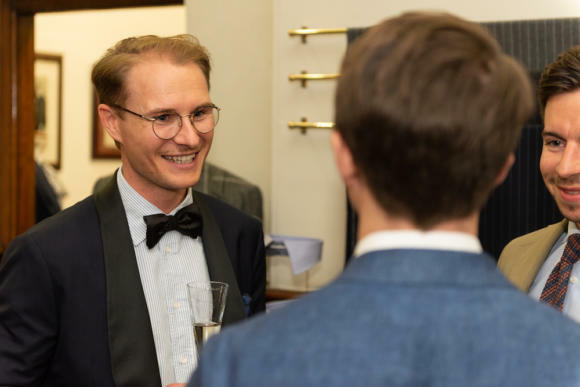 Very nice to see so many people who had travelled to the event and yet managed to look so elegant; a great deal of the effort to achieve this is not always immediately obvious.